In this article, I briefly want to outline what happens when a science documentary is made. Much of the process is mundane, so this might not be a riveting read, but if you are interested in a career in science TV then this might provide a useful insight. The first challenge for any film-maker is finding a story. Everybody in TV is looking for the great untold story, and the good news is that do exist. 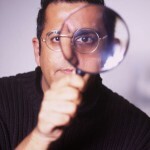 You might find a story through hardnosed journalistic investigation or via your network of contacts. Sometimes the stories are just sat there waiting to be told. When Dava Sobel decided to write a book about John Harrison and the marine chronometer, it was already a well-known story, but nobody had ever considered that it might be the basis for an international bestseller. The result was Longitude. 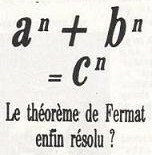 In this case, Fermat’s Last Theorem hit the headlines in 1993 when Andrew Wiles announced his proof. The story was on front pages around the world, and every TV science producer must have been aware of it. However, the majority of them must have thought that this was no basis for a TV programme – after all, mathematics is fundamentally boring! This was a story that was not about the cure for cancer, it did not involve dinosaurs or volcanoes, it did not have spectacular pictures of the universe and it was not easy to understand. John Lynch, however, believed that Wiles had a uniquely powerful story to tell, one that more than made up for the lack of pictures and tabloid punch. John was already a senior producer in the BBC science department, which was lucky because had somebody else pitched Fermat’s Last Theorem as a TV documentary then they probably would have been turned away. It is a great tribute to John and the BBC in general that this programme was commissioned. No other TV station in the world would have touched this idea with a barge pole. Long live the license fee. John began researching the project, but Wiles was being very elusive. Although John did not know it, the flaw in Wiles’s proof had been found, which is why Wiles was in hiding. Eventually the existence of the flaw emerged, and the TV project was abandoned. A year or so later, the flaw was fixed, and Fermat’s Last Theorem had been proved at last. By this stage, John Lynch had been promoted to boss of the whole Horizon, so he was unable to make the documentary that he had started researching. John asked me if I would come on board to make the programme with him. He would escape from the office whenever possible, and we ended making the programme together. The entire project from commissioning a Horizon programme to transmission takes about six months. I spent the first month getting my head around the story and the mathematics. In terms of the story, the question is what is the story, then which bits are essential, which bits are visual, which bits make good telly, and which bits can be left out? This process of research is done partly by speed-reading books, partly by reading recent articles from the popular and scientific press, and partly by talking to any mathematician who can spare the time. The second month is more of the same, but with one eye on how the story is going to be filmed. I chatted to potential interviewees on the phone for an hour or two at a time, and where possible I visited them. John and I spent three days in Princeton visiting Andrew Wiles and others, checking out filming locations and trying to gather the first hand accounts that would provide the backbone to the film. As the research drew to a close, I began drafting scripts, sketching storyboards and listing shots. In theory, directors work out what they want to film based on the research, but in practice half of it never materialises on film. On the plus side, dozens of unexpected things do appear while on location, which more than makes up for the minuses. So sooner or later, all the scripts and shot lists are thrown away, and a director has to concentrate on what can be done with what has been filmed, rather than what could have been done with what was supposed to have been filmed. Filming took us well into the fourth month. We travelled to Cambridge, then to Princeton, then to Boston, and then to San Francisco. The bulk of the planning was done by the production assistant Alexandra McLeod, who monitored the finances, checked that everything was on schedule and stopped the project falling apart. The bulk of the filming was done by Joe Vitagliano, which meant that we soon built up a close relationship. It also meant that everybody involved in filming became familiar with the story, which really helped to build trust between the mathematicians and those us behind the camera. Another important factor in building trust was the time spent prior to turning on the camera. Phone calls, pre-shoot visits, and long interviews on film meant that the mathematicians were willing to open up and talk about how they felt. When an interviewee breaks down with emotion on camera, it is not because the director turned up five minutes beforehand. The emotional opening shot also demonstrates another aspect of the close working relationship that developed among the crew and mathematicians – just as Andrew Wiles is about to become overwhelmed, the cameraman Joe begins to gently, almost imperceptibly, zoom in on his face, so that he has a close-up on Andrew at the crucial moment. I certainly did not prompt that zoom – it was the result of a cameraman who had immersed himself in the story that he was filming. There are dozens of stories relating to the filming, but perhaps I can pick out just one more. It is important that each person in the film establishes a clear identity, so that the viewers can rapidly engage with each character. Interviewing different people in different places helps this process. So, Ken Ribet, a laid back mathematician based in California, was interviewed at an outdoor Berkeley coffee house. The location fitted in with his character, it was a distinct location, and it was a place where he felt confident and relaxed. There was also the opportunity for various shots and noises – the faces of other coffee drinkers, the swish of the coffee machine, the clinking of cups. If you have seen the documentary, then you might have wondered why Ken’s table was apparently piled high with sugar cubes. Do Californians have a sweet tooth? In fact, this was a smart but failed idea on my part. The idea was for Ken to demonstrate that squares can be added to form bigger squares, by rearranging a 3×3 and a 4×4 array of cubes to make a 5×5 array. Then he would try rearraning a 6x6x6 block of sugar cubes and an 8x8x8 block to form a 9x9x9 block, which does not work. In other words, this was a tangible way to demonstrate Pythagorean Triples and Fermat’s Last Theorem. I can’t remember why it did not work – it was probably too fiddly and took too long – but the end result was something that did not appear in the final cut. The only legacy of this neat idea was a rather bizarre mass of sugar cubes in front of Ken. After about 17 weeks, we returned to London with dozens of hours of footage, and the process of editing began. For me, this is the most fun part of film-making. As each day passes, the documentary gradually takes shape. Some days the film looks like a horrible mess, while on other days it seems as though it is beginning to gel. Oh … and this is the point when all previous scripts and shot lists get thrown in the bin. There is no point wishing what might have been – we had to focus on what we had filmed. The editor was Horacio Queiro, whose influence on the film was enormous. Essentially, we spent 5 weeks locked in a room exploring every possible option. Sometimes the shifts in storyline and emphasis were radical, such as when 300 years of history were condensed into 10 seconds of photomontage. Fermat’s Last Theorem has a rich history, and we had always intended to spend several minutes outlining the centuries between Fermat and Wiles. But it soon became clear that the living mathematicians were far more interesting than second-hand accounts of dead mathematicians, and the history became whittled down to just a couple of unsatisfying minutes. It was at this point that we ditched the history completely and bridged the 300 year gap with some shaky footage that we had shot handheld and some snazzy harpsichord music. The result was a sparky sequence that added pace to the film at a critical point, which was much better than the plodding history that had always been envisaged. Music is a crucial part of the editing process and finding the right music is always a satisfying achievement. One evening, after a long day of editing, Horacio and I decided to head out for a pizza prior to more editing and a late night session. It was in the Pizza Express on Shepherds Bush Green that we heard the music that we had been searching for. The waiter told us that it was the Penguin Cafe Orchestra, and the next day we ordered up every album that they had ever released. Their music would pepper the final cut. You might also remember a track by Blondie in the documentary. This upbeat track provides a small interlude, marks a gear change in the programme and takes us across the Atlantic to San Francisco. The reason that it was Blondie, as opposed to Aerosmith or the Beach Boys, is that they recorded on a British label, which means that copyright clearances are much easier and cheaper. After 5 weeks of editing, a dozen versions, and half a dozen viewings with John, we eventually achieved our final cut. The final month was an anticlimax. Forms have to be filmed, graphics have to be completed and rostrums have to be completed. Sound has to be mixed and the final pictures have to be laid down, but this seems like a chore compared to the fun of editing. Writing the script for the narrator and recording it is a minor highlight. This period is also an opportunity to drum up publicity, which is actually rather important. There is no point making a decent programme if nobody knows about it or watches it. So I wrote an article for Roger Highfield, science editor of The Daily Telegraph. Usually this would not be worth mentioning, but this was the first article that I had ever written. This was my first published work. For me, it was a real milestone towards writing as a career. The programme was transmitted on 26 January, 1996. People liked it. The Guardian said that the programme showed that “maths is the new rock’n’roll”.